I usually work with many windows open at the same time. 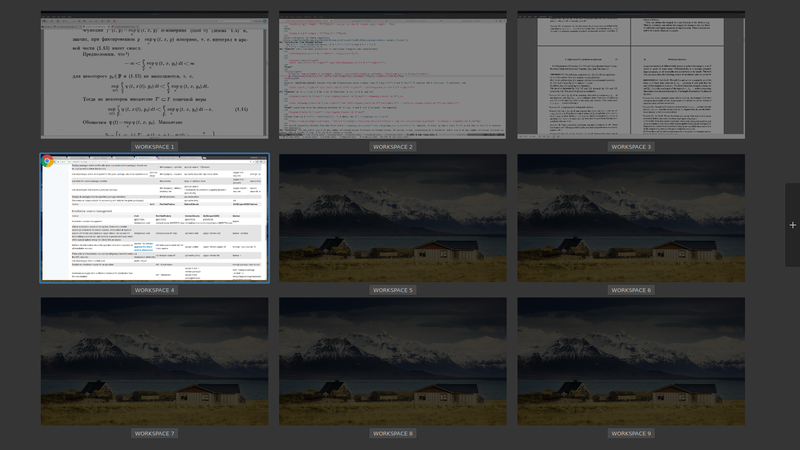 Say, writing something in means having editor and a couple of PDF-viewer windows open; throw in browser, reference manager, a terminal or two, and you easily end up at 8-10 windows. Unfortunately, switching between as many as 5 on a single workspace is already rather tedious, be it by clicking and dragging, or by Alt-Tabbing your way around. One would think that a good window manager, Cinnamon being an example of such, should allow to fix this. For some reason though, Cinnamon only provides left/right inter-workspace motions out of the box; I find it more natural to think of the workspaces as sitting on a 2d grid. Apparently, there are people sharing this sentiment: a quick search reveals a discussion on unix stackexchange, where somebody mentions using 16(!) workspaces. Besides, there already is an applet that purports to do precisely what I want; the fact that it conflicts with Expo and does not allow to move windows around makes it somewhat suboptimal. The suitable solution hack was to write a basic wrapper around wmctrl in Python and to tie shortcuts to it using the Cinnamon config. There is also xdotool, which would probably do the trick as well. etc., with “-d” for “desktop” and “-t” for “to (desktop)” performing jumping and moving the active window in the specified direction. The script is below and in the repo. I imagine it would run on any WM compatible with wmctrl so, according to the manpage, any “EWMH/NetWM compatible X Window Manager”. x- and y-coordinate. Indexing is row-major. Defaults to 2x2 workspaces.